moven00 Inilah dipanggilnya distribution from shark to retailer. Lu orang mau share buyback statement, shark boleh buat. Mau dividend utk main dgan emotion anda, shark boleh buat. Mau result cantek2 shark pun boleh. mcmann who is HaLie ? moven00 Kawan2, one thing I start to learn...when someone keep promoting a counter, we kena berhati2 lo. Mereka ada Udang disebalik batu. Klau mau fight boleh, tapi kena tau take profit atau cut lost. Shark trend terbaru....mereka buat buat semua cantik cantik, baguih punya announcement, dividend cantik, Data semua ok. So umpan you’ll jadi long term investor. Classical case...pi tengok itu Homeriz. Cun sampai hampa mampuih. Berhati2 la Kita retail investor...bila orang bagi tp Dan promote sesuatu counter...Kita dengar Dan analyse sendiri. Mau ka mereka, kasi duit sama Kita. ramada Wrong theme to play. mcmann for me its also a 2 side story just watch ! Tan Frankie Gave 4 cents,down so much? coolio Fundamental never change, still excellent stock to invest. Latest result was excellent. Add more lohh when price is down,good time to accumulate more at current price...why want to worry. idunwork May be more than 7.5 million due to higher plywood price and late shipment last quater. balvin71 USD up against RM. Will be good for FLB. timber profit margin also quite stable. 4) Trading at low P/E Ratio. ZhugeNemo Longer than expected consolidation. Will this be relief rally or uptrend reversal.? 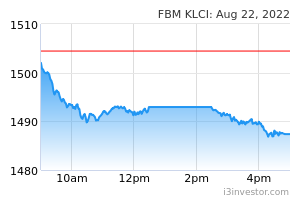 speedlikecy follow the KLCI up, ringgit weak, FLB should be uptrend. nich0las QR give 8sen, Announce give 4sen. Next QR will add back more 4sen. yes! LiimInvest We hope so. Yes ! idunwork Hard to find another counter as good as this one. Lots of cash, no debt, high and consistent dividend, good profit prospect and its directors are not greedy. yfchong RV growth in us promising?